It's been almost seventy years since Albert Einstein argued that "science without religion is lame, religion without science is blind" in an influential Nature essay. The faceoff of science v. religion, however, is far from over — just ask our creationist VP nominee. In Berkeley, California, one artist is attempting to heal this rift by introducing the concept of "scientific worship." I bet you the Pope'll be thrilled.As io9 sister site Valleywag reported a few days ago, September 27th will see the opening of the first temple of science worship. Establishment of an Atheon has been a high priority in the scientific community for the past several years, rivaling even enthusiasm for the new Large Hadron Collider. "When you listen to people like Nobel-laureate cosmologist Steven Weinberg, or Oxford biologist Richard Dawkins, you hear a lot of talk about how god-based religion is out-of-date," says conceptual artist Jonathon Keats. "The leading minds believe that science can and should provide a spiritually satisfying replacement. But until recently no one bothered to consider what form that alternative might take." The Atheon is a secular temple devoted to scientific worship. Delivering spiritual fulfillment through exposure to the latest research in fields ranging from cosmology to quantum mechanics, the Atheon offers a nondenominational alternative to theocentric religions such as Judaism, Christianity, and Islam. Our credo is to make faith rational. Sounds like a great idea to me, especially when you consider that the Atheon will feature stained glass windows with NASA images of cosmic background radiation. But is cool art enough to combat the revulsion that so many scientists — say, for example, Richard Dawkins — have for organized religion? If the modern minds of science are growing more and more comfortable rejecting traditional spirituality, it's difficult to imagine what kind of niche this Atheon will be filling. It could easily become just another art museum, or just another place to hear physics lectures. Keats doesn't seem to fear those eventualities. He sees a future with "an Atheon in every town." I don't know about that, but the Atheon certainly appears to be a step in the right direction for every string theory nerd who'd like to have someone to pray to — and every Southern Baptist who's afraid they'll be foisted from church for studying biological engineering. 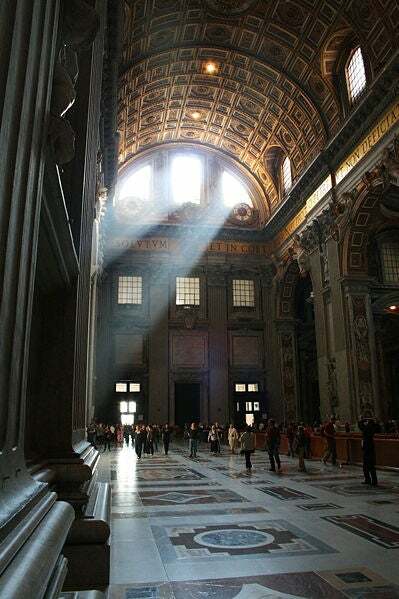 Image of St. Peter's Basilica in Vatican City from Wikipedia.